Drawing, painting, anything creative on offer and these kids dive right in. Without the usual materials available allowing children to discover, nuture and let loose their creative talents, anytime they get the opportunity to have a go at such things is met with great enthusiasm and followed by a couple of hours of complete peace and tranquility! The children find themselves completely absorbed in the creative process and a normally very vocal, energetic bunch show and experience another side of who they are. A welcome break for the teacher too!! Using permanent texters here donated by a couple of visiting surfers they get busy taging, drawing and writing on surfboards. Jodi (pictured) showed a particular love and flair for this. 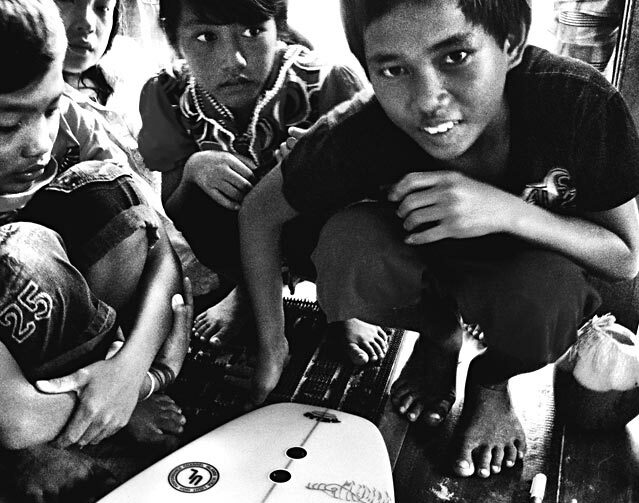 Rip Curl, Quiksilver, Volcom, Nike to name but a few are now to be found hand-drawn on many a board out here!